As somebody who is big into productivity, I have a dark not-so-secret in not getting along very well with to-do lists. Lists, right? The mainstay of productivity and task management. Recently I discovered a project management app called Trello, that fills the spot for me. Let me run you through it. Oh, and it’s FREE! Task lists and project management spreadsheets were very much part of my project management jobs in the software development industry, and I welded MS Project Manager, Excel spreadsheet reports, and email reminders with the best of ‘em. But then I left the business, and got lazy about task management. My laziness was due to my fortune of having a good memory for tasks, day-by-day. I tend to be good at prioritizing them internally also. But age and the growing heap of scheduling now necessary for my daughter’s educational activities mean that I’m jumbling more and more thoughts, and risking dropping those eggs. Mixed metaphor be excused! As writers, most of us appreciate the need for organisation and structure in both our writing life holistically, and that of each writing project. Without some task organisation we won’t get that far. would allow a task progression from column to column (as with the Japanese principle of Kanban, which I discussed in this April post) – from To Do, to Doing, to Done. provides the ability to rank or tag priorities on tasks. and is flexible to my process patterns. 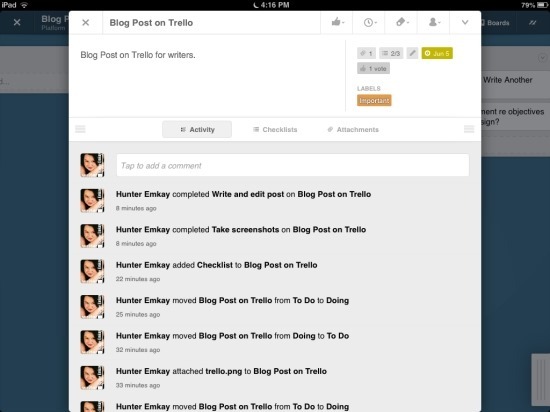 Then I discovered Trello. It’s not perfect on every count, but it comes close. Let me show you (below). * Why sharing, you might ask? Normally writing is a lonely task, but I wanted to think about how I might share my writing work with beta readers and the like, and receive feedback. Signup is easy. Go to the Trello website, and enter your email details or signon with your Google account. Once in, you will be presented with the Boards page. Under the ‘My Boards’ heading, you will find the Welcome board. Open that to see some instructions on Trello. Trello operates as a web-based app, or you can download various apps to use on Windows 8, iOS (I use Trello on my iPAD – see below) or Android. 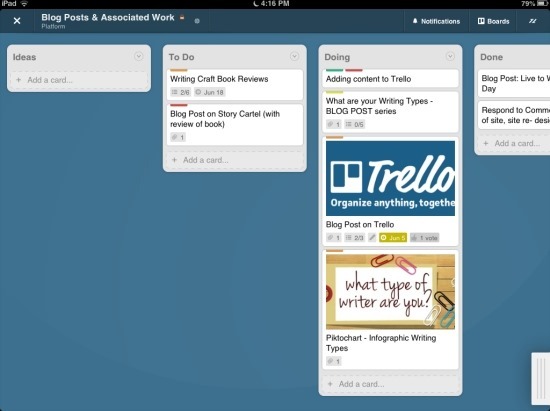 The apps require internet access, however, and log into your web account with Trello. Offline you will only have read access. You can create as many boards as you want. You can also sort these boards into an “organization” – this is a group of boards. Each organization can be shared with other trello members – you can invite other writers or readers to these, or keep private to yourself. Boards can be moved around between organizational groups. Boards can be private to yourself, or shared. You can share a board to somebody else’s organization also. The above image shows my Boards page in a browser. The top header – My Boards is where I keep personal boards, for larger life projects. I have three writing “organizations” or board groups – Platform, Writing Life and Writing Projects. Inside of these are several boards such as the “Kaizen Board – Learning & Knowledge” sitting in Writing Life, or the “WIP – Blue Popcorn (NOVEL)” board sitting under Writing Projects. A look inside my Kaizen board. The right –hand sidebar of admin functions can be slid to the side, allowing for more screen-space. New boards have three lists to start off with – To Do, Doing and Done. These lists can be renamed as you please, plus you can create or delete lists – which appear as columns to suit your own process. In the sample Kaizen board I’ve got four lists – Coming Up, Current, Wanna Do’s and a blank one left over I’ve simply called List for the moment. (if you’ve not guessed already, this board keeps all my writing courses, workshops and other writing improvement tasks). A look inside my Blog Posts & Associated Work board. Under the lists are Cards – or tasks. New boards don’t have any tasks, but it’s a simple matter to add a card there. They are ordered in chronological time of creation. The cards you see in my sample boards have various tags on them – due dates, coloured tags to denote priority, icons to signify there’s a checklist inside. The Blog Post board shown above also has cover photos attached to two cards. These photos – or files – can be attached by dragging and dropping onto the card, or from inside the card. Inside a card (or task) there are functions which allow you to set a due date, create a checklist of tasks (and check them off), attach files, assign the card to another member, subscribe to notifications when the card changes, and vote. From the board panel, cards can simply be dragged to move from column (lists) to column. A checklist item inside the card can be changed to becoming a card of its own. This is useful if you want to take one of the smaller tasks in the checklist and assign it out to a team member, or assign an individual due date. Another sample card, showing the labelling system. Aside from assigning due dates – which flag to orange when about to expire – and assigning tasks to team members, the other way to manage tasks is to use the labelling function to tag the cards with a colour. These are completely customisable per board. In the above sample card, found on the Blog Posts board, I have chosen to label three colours as to priority. If you scroll back to the Blog Post board image above, you will see various cards with various priorities. The flexibility of Trello allows you to create any kind of process flow you can think of. You can set up these lists and cards, and flow them across the process, assign to team members for comment and votes, subscribe to notifications. Remembering that Trello is free to signup to, you can invite other team members onto your groups or boards. Consider the application of this approach for when you want beta reader feedback, or feedback on some proposed changes on your website, or when colloborating with some other writers. Comments flow as activities down from the card – all changes and activities are notified via email, and on the cards (tasks) themselves. See the screenshot of the iOS app below to see the activities on one card. However, once members do have access into your organization, they can create private boards for themselves. Boards can also be made public – making them findable by Google search, or you can send out a direct link into the board. However only board members can edit the card / board content. If you want more secure management of your boards, and your project sharing structure gets larger than the average writer, Trello offers a business package for $25 per month at time of writing. This package allows for Google Docs access also. Trello board on the iPAD. 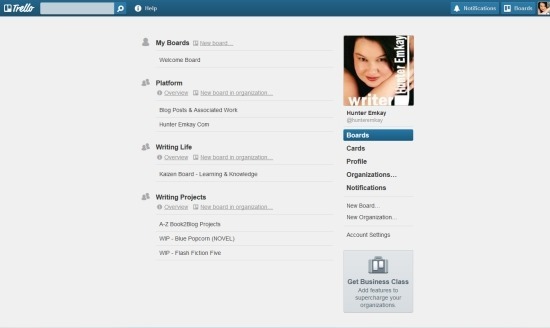 Trello card on iPAD – showing activities against card. Users like me can go on the go with Trello. There is an android and iOS app. They require internet access, however, for editing. But offline, you can at least read your boards and cards, if you’ve updated them before leaving an internet access point. 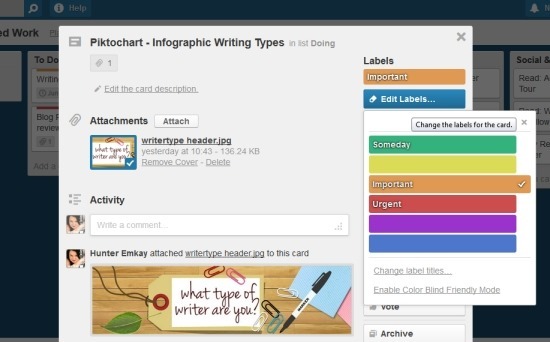 Trello is a free app created by Fog Creek Software. Signup on the website here, read the Trello blog or tweets, and like the Facebook page or Google page. IF you appreciated this post, please also LIKE it, or share it with others using the share buttons below. Comments are also welcomed, of course. Glad you found something you like! And I hope your readers find my instructional post helpful. That app looks particularly handy for shared projects. I confess that my own project management works via paper – largely because I refuse to be framed by somebody else’s idea of how I should work, represented by the structures imposed through software. I’ve always found I spend more time struggling to get the software to do what I want and meet my vision of what constitutes an efficient work-flow in my terms, than I did planning. But that’s just me and others will, I am sure, differ – it’s all good. Yes, Matthew. I think you hit on part of my own problems with lists and all those to-do apps that I have tried out beforehand. The structure was too inflexible for me (and I’m changeable). I so far am still enjoying Trello, however – because I can create as many lists or not,and as many cards or not. So far,so good. I would recommend checking out Gtdagenda for an online project&task manager. I’m letting this promotional comment through, because GTDAgenda does look good for task progression, and has been mapped through to David Allen’s GTD and even the Zen To Done process. However, the free account only offers 2 goals and 4 projects. For some writers this might be enough. What Stage in Your Writing Career are You?